Most F-TR rifles are essentially prone rifles adapted for use with bipod and rear bags. They feature prone or tactical-style stocks designed to allow a firm grip on the gun, with cheek, hand, and shoulder contact. This has worked very well. Unquestionably, a skilled F-TR shooter can achieve outstanding scores with such a configuration — it works. However, “there’s more than one way to skin a cat”. 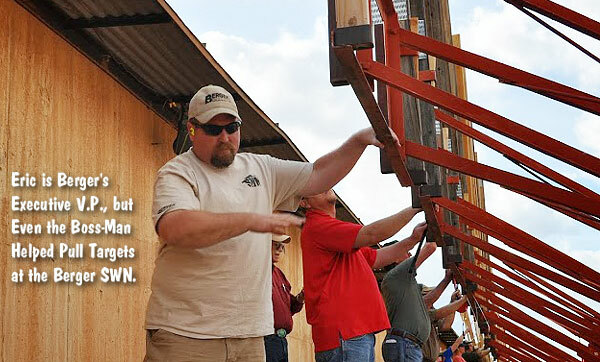 At the Berger Southwest Nationals, Eric Stecker introduced a new type of rifle, and a new type of gun-handling, to the F-TR ranks. Shooting “free-recoil” style* (i.e. with virtually no contact on his rifle) Eric managed to finished second overall in F-TR (with the highest X-count), beating some past national champions in the process. Thinking “outside the box” worked for Stecker in Phoenix. The success of Eric’s benchrest-style rifle and shooting technique definitely drew the attention of other F-TR shooters. 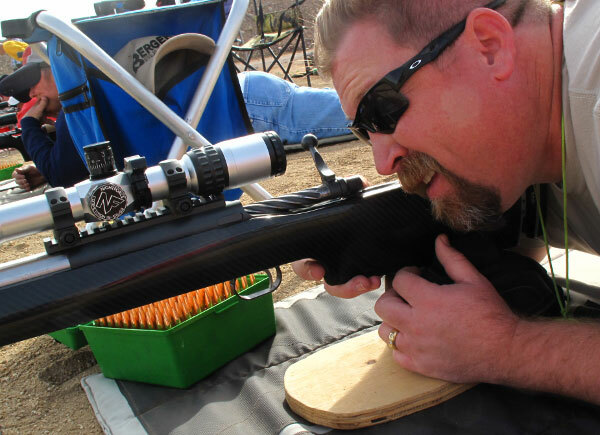 VOICE FILE: Eric Stecker Talks About the SWN and his Radical F-TR Rifle. 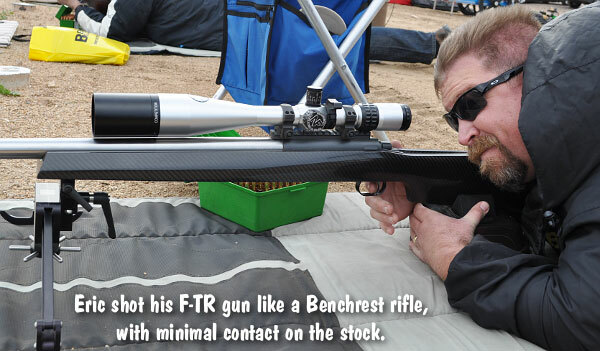 Eric’s F-TR rig was built by John Pierce using a stiff, light Scoville carbon-fiber stock. 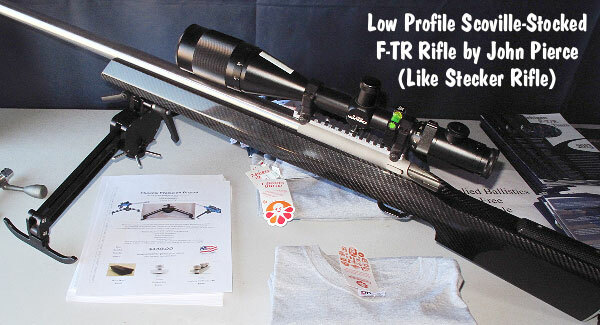 The stock is so light that Eric’s rifle came in 1.5 pounds under the F-TR maximum weight limit (8.25kg or 18.18 pounds). 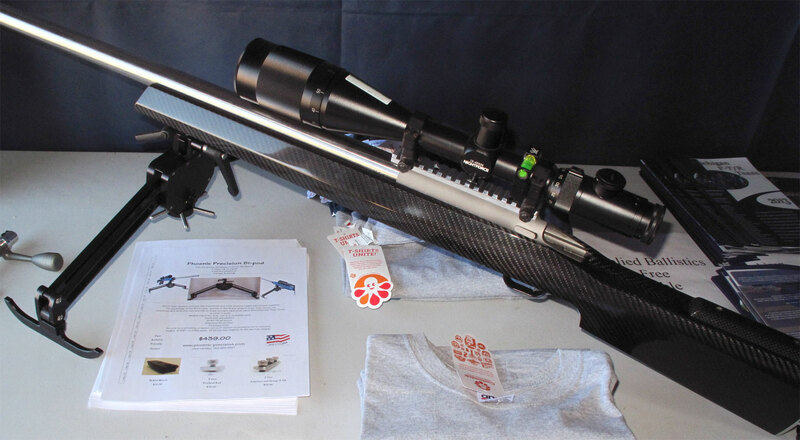 The gun features a Pierce action, Bartlein barrel, Jewell trigger, and a Gen 1 Nightforce 15-55X52mm Comp scope. From the get-go, Eric’s strategy was to “aim small” and shoot his rig like a bench-gun. He actually focused on shooting really small groups rather that just trying to keep shots within scoring rings and “hold waterline”. With a .308 Win that could shoot bugholes at 100 yards, this strategy paid off. Eric sets up rifle before match. During live fire his hands do not contact the stock. 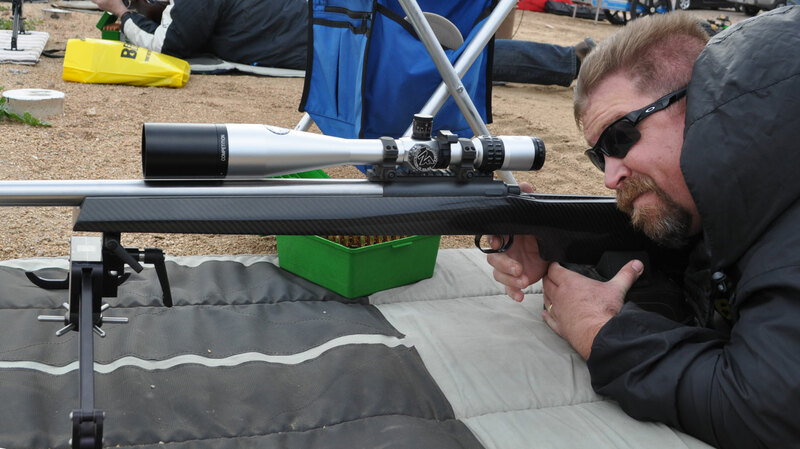 VOICE FILE: Eric Stecker Talks About Shooting F-TR with Benchrest Technique. Eric also employed an unconventional strategy — he was focused on shooting small groups (not just holding ring values): “Since I have started shooting F-Class, I treat [the target] like a benchrest target. What I mean by that is that I regard the center as my first shot, and so my objective is to create the smallest group. So, I will hold whatever… is required to end up with the bullet ending up in the center — that’s probably true of any F-Class shooter, but I guess the perspective’s a little different when you have a benchrest background.” Eric explained that “maybe I aim a little smaller than others might”, because in the benchrest game, “the slightest miss ends up costing you quite dearly”. Will other F-TR shooters build rifles suited for free-recoil-style shooting? Eric isn’t sure: “I don’t know if this type of rifle is the future of F-TR. I shoot a lot of benchrest, so putting those kinds of components into an F-TR gun made a lot of sense to me. One thing I like about F-TR is that there are a lot of different types of approaches being tried and some of them are successful. So I think it’s still pretty wide-open[.] But I think the really great part of what we found at the Southwest Nationals is that shooting [with] a benchrest-style approach certainly doesn’t hurt you. What I mean by that is … aiming small, trying to make the group as tight as possible rather than trying to hit a particular area. I actually tried to shoot tight groups — that was a focus and that worked for me — I had quite a high X-Count.” NOTE: Eric finished with 51 Xs, 14 more than F-TR Grand Agg winner Radoslaw Czupryna (37X). James Crofts had the second highest X-Count with 48 Xs. Even Berger’s Boss did pit duty at the Berger SW Nationals. *”Free Recoil” style shooting has its variations. Some would say “pure free recoil” would not even allow shoulder contact. Eric Stecker lightly touches the back of the stock with his shoulder. Share the post "Stecker Succeeds at SWN with Radical Benchrest-type F-TR Rig"